Commercial awareness is a term you’re constantly hearing. But it’s not exactly clear what it is, how to improve it and how it’s tested during applications. This guide will give you some hints, tips and resources needed to understand commercial awareness more than others at assessment days. It could be the difference between training contract success and failure, so read on! There are varying assortments of advice & opinion on the topic, but the fact of the matter is that commercial awareness is going to mean different things to different people and firms. It’s very subjective. Asking the above question is missing the point really. Commercial awareness is more like an entire subject area rather than a single phrase which needs a definition. Being able to define it won’t help. 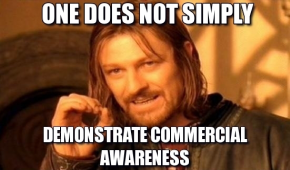 In fact, if you get asked “what is commercial awareness?” at an interview I’d be very worried! That’s totally missing the point. If you want a definition it can essentially be described as the understanding of how the world of business politics and economics impact law firms. You need to understand how concepts like customers, competitors, supply & demand, and profitability will have an impact on a law firm. This is not only to do with the matters which directly impact law firms – like a new piece of legislation which allows compensation to be claimed, but also wider matters of the economy; like a recession. It’s all about keeping up to date with the latest business & legal news and interpreting it in order to anticipate what it could mean for the future of an organisation. You may think “why do I need to understand marketing?”. Well law firms have been especially slow to engage with social media and web marketing. Knowing how the online landscape is changing, and how it can be used to increase revenue would be hugely beneficial to any firm. So when thinking of commercial awareness, think as broadly as possible. The above list is just a fraction of the areas which could make up the topic. The challenge in nailing down a definition is perhaps due to the actual term “commercial awareness” which doesn’t do a good job at encompassing what it’s all about. It just gives you a vague buisnessy impression. To get a better understanding you need to think why firms want you to have it. The leader of the future. They want you to have it because one day you (hopefully) will be in position where you will leading the firm. You’ll need to make the decisions which can make or break the business. Obviously you will need to be very commercially aware to do this. Having a good base knowledge on which to build is going to be essential. You’ll need to do this, albeit on a smaller scale, as a solicitor too. Doing your job better. They want you to have the contextual knowledge which will be needed to do your job. Knowledge of the law alone won’t always be enough. Additionally it could help you better understand the needs and requirements of a client. You will know why they are asking for a service which may give you the extra knowledge required to take a new / better course of action. This in turn could bring in more business for the firm. You shouldn’t just be improving your commercial awareness for the sake of getting a training contract. That attitude actually misunderstands why it’s important. Rather you should make it a part of your day to day life so you can improve and enhance it going forward in your career. Improving you commercial awareness isn’t something you can do over a matter of hours or even days. It needs to be a consistent and prolonged effort. You should start simply by keeping up to date with the business news. This doesn’t really take that much effort. All you need to do is read the BBC business news daily, or even a couple of days per week. You will quickly pick up the key issues facing the British (and global) economy at the moment and even start to develop your own opinions. Newspapers such as the Financial Times are also a good way to develop this awareness. A rudimentary understanding of the stock market is also essential in order to show you have a good understanding of business. A great way to get experience of the stock market without any investment is to play an online game like Virtual Trader. 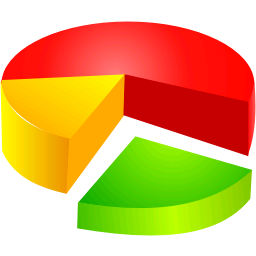 It may be worthwhile researching exactly what the stock market is if you have absolutely no prior knowledge. If you’re reading the BBC news site however, you should have already got a good idea of the basics. To further fill in any blanks in your commercial knowledge you should do your own research. Even wikipedia is a good starting place for this. Try searching for “economics” or “economy of the UK” to get started and then simply click on the related articles when you come across an idea you’re not familiar with. Once you think you have a good general understanding there is one more key thing to do: Think. Think how this all relates to the legal sector, and form an opinion. What do you think of current government policies? What would be your advice to law firms in this climate? What do you think the key business stories within the next year will be? These will help you answer interview questions in the future (see below). Form your own opinions on the matter – it’s not enough just to provide definitions. That’s not what law firms want. Work experience is also a good way to enhance your knowledge. Working in different companies (don’t always need to be law based) can help give you a good general knowledge of business in a number of sectors. Even working at a supermarket or restaurant could help – especially if you ask your boss some key questions about the main factors impacting sales. Understanding some of the key economic concepts can be a real challenge. These may be questions like “What caused the recession?” and “What do you know about the Greek debt crisis?” It takes time to understand matters like this. However there is an amazing resource to help you with this. What’s even better is that you don’t even need to read anything – you get all of this information through videos! The site is called khanacademy.org. Just go to the finance and economics section. It also has some great information regarding the stock market. Here are a few of the most important videos answering questions you may be asked. These should over prepare you, but as we said above, it’s not just about passing interviews, but rather building knowledge for your future. Knowing this stuff will will put you in a different league to those who only know the basics. The video on the left is about the Greek debt crisis and the one on the right is an introduction to company stock. There could be a specific question on it in your application. Just answer this as you would a normal essay question using the knowledge you have gained. If there isn’t a question on it try and at least mention something commercially relevant in your application. But don’t make it seem forced!How is it tested during assessment days? What key changes have there been in the legal sector recently? Where do we generate most of our income from? What are interest rates currently held at? If you’re asked to do practical exercises being commercially aware is essential. You may be asked to develop a hypothetical legal product offering. This would require you to think about who you would be selling to, whether your price would be affordable to them, any upcoming legislation which could impact your product, what your competitors are offering, and much more. It’s also possible you will be required to hold a group discussion at your assessment day. One of the topics of discussion could be something to do with the current state of the economy, or a new piece of real or hypothetical legislation. Without being commercially aware you will be unable to contribute much to the discussion. Just like in an exam, simply knowing the facts won’t get you a good grade. You need to be able to be able to apply it. That’s where you can really impress during assessment days – understanding commercial awareness and being able to use it. Overall the best advice we can give is to just read / watch the news; especially the business stories. This way you don’t need to put in lots of hours every day into improving your commercial awareness (which isn’t the best way to do it anyway). The earlier you start the better. This way you will be able to see how various commercial and economic issues begin to change and evolve over time. Because of this you can really put it to use and begin to think about the practical implications.